Solid waste and recycling collection for the City of Ridgeland is handled by Waste Management of Mississippi. The City of Ridgeland provides additional services such as large debris collection. Rewards for recycling are available through RecycleBank. For an overview of recycling and solid waste services, consult the Recycling and Solid Waste Guide. You may find the schedule for recycling, trash, and yard debris collection in this guide. If you have any questions, please review the information below and the frequently asked questions prior to contacting the Public Works Department. Curbside recycling collection is provided by Waste Management. Please use the rolling cart provided by the City of Ridgeland and place it at your curb by 7:00 a.m. on your designated collection day. The recycling cart is geotagged to your address and records the amount that you recycle. Recycle as much as you can to earn more rewards. Many types of waste can be recycled including paper of all types, both aluminum and tin cans, and plastic bottles or containers. See the Recycling Flyer from Waste Management for information. For questions about the recycling collection service, please call Waste Management at 1-800-284-2451 or the Public Works Department. There will be no recycling collection on the following holidays: Christmas, New Year’s Day, Memorial Day, Independence Day, and Thanksgiving. If your collection day falls on one of these holidays, your recycling will be collected on your regular pick up day the following week. Residents and small businesses of Ridgeland may also use the dumpsters specified for recycling at Central Fire Station, 456 Towne Center Boulevard. Click here for information from the Mississippi Department of Environmental Quality about the importance of recycling. The City of Ridgeland has teamed up with Waste Management and Recyclebank to reward you for home recycling. Recyclebank rewards you for taking everyday green actions—like recycling—with discounts and deals from more than 3,000 local and national businesses. On average, Recyclebank members can earn up to $165 in reward value through their annual recycling efforts. Simply register at Recyclebank and follow the online prompts to verify your home address. You will need to enter a PIN, which you should have received in the mail. If you don’t have your PIN, don’t worry! You can request a PIN on the website and have it sent to you via text message or mail. Once you receive your PIN, go back to Recyclebank and enter it to complete your registration. You can also call 1.888.727.2978 to register. Recycle all that you can with your Waste Management recycling cart; it will be collected and weighed along with your neighborhood’s recycling. If you’re a Recyclebank member, you’ll earn points each time you bring your cart to the curb. Your recycling cart is geotagged to record the amount you recycle when it’s collected. The more you recycle, the more rewards you can earn. Remember: In order to view and redeem your points, you must register at Recyclebank or at 1.888.727.2978. The more points you earn, the more rewards you can get. Redeeming Recyclebank points for rewards can save residents money each time you shop at many national retailers and local businesses right here in Ridgeland. Rewards range from magazine subscriptions to “buy one, get one” deals and gift cards to local businesses and national retailers. We believe that the Recyclebank program is a win-win-win for our residents, local businesses and the environment. You can redeem your points at Lost Pizza, College Corner, Fleet Feet, Fin Fish House, Indian Cycle, and Smokin’ South BBQ. So don’t wait another minute! Register today. You already recycle, now get rewarded for it! Household Hazardous Waste Day for residents and small businesses of Ridgeland occurs every May. Holmes Community College is the host location on Saturday from 8 a.m. to 12 noon. Drive up with your items and volunteers will help you unload them. Items collected include propane tanks, flammable aerosols, flammable paint, flammable liquids, pesticides, herbicides, corrosives, dry cell batteries, motor oil, antifreeze, tires, and electronics including television sets, computers and printers. Please check the community calendar for the scheduled date. To dispose of hazardous waste throughtout the year, go to the Jackson Environmental Center located at 17108 Terry Road. Their office hours are Tuesday and Thrusday, 8 a.m.-3 p.m. and the fourth Saturday of the month, 8 a.m.-3 p.m. 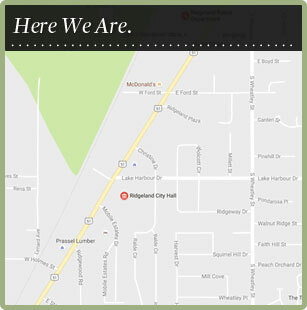 This residential service offered by the City of Ridgeland includes the collection of large yard debris from your curb. A knuckleboom truck that the City purchased for use after storm events is being consistently used to better serve residents. The truck is designed to pick up large piles of debris. You do not need to bundle, bag or cut your tree limbs to any certain length. There is no weight limit to the yard debris that the city will collect. Please be advised that if a tree surgeon, a contracted tree trimming operator, or anyone other than the home occupant cuts your limbs that the City requires them to dispose of the waste. Collection in your neighborhood occurs one Monday of every month, according to the Route Map. Place debris within 10 feet of the curb by 7:00 a.m. on your collection day. Garbage, appliances, and hazardous waste will not be picked up. Waste Management collects yard debris on the second collection day of the week. Waste Management requires that yard debris be bundled, bagged, cut into lengths of no longer than 5 feet, 8 inches in diameter, and not weighing more than 60 pounds. Leaves must be bagged. If you have a large amount of yard debris, it may take more than one collection for Waste Management to remove it completely. Please do not sweep grass clippings, leaves, and limbs into the storm drains as it could lead to flooding in your street. We recommend following the directions for collection by Waste Management outlined above. Or, for a more environmentally-friendly alternative, you may compost suitable yard debris. Backyard composting is a way to recycle leaves, grass clippings, pruned plant material, and certain food waste. Decomposed organic material can be returned to the garden and landscape adding beneficial nutrients to the soil and reducing the amount of garbage sent to the landfill. For more information about Solid Waste and Recycling, please contact Mike McCollum at 601.853.2027 or mike.mccollum@ridgelandms.org.